Did this brain appear from nowhere? Twelve organic brains spontaneous appeared around Bolingbrook on Saturday. Carl, who asked that we not use his last name, claimed that one of the brains appeared while Mayor Roger Claar was hosting a BBQ. According to Carl, Claar had just turned away from his grill, when former Mayor Edward Rosenthal commented that he didn’t think cow brains could be grilled. Everyone at the party suddenly felt intense pain. A second later, the brain disappeared, and the sensation went away. 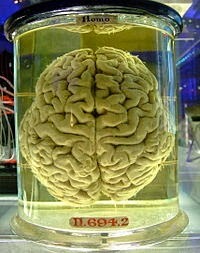 Jacqueline, who asked that we not use her last name, said her 5 year old daughter saw one of the brains. A source familiar with Bolingbrook’s 911 Dispatch department confirmed they received calls regarding the brains. Though it may seem impossible, The Skeptical Teacher said it was scientifically possible. The Skeptical Teacher said the brains were most likely harmless. He suspected that during their brief existence, they are just confused because their sensory experience doesn’t match their preformed memories. If anyone encounters such a brain, he said they should not panic, but wait until it disappears, and clean up the area it occupied with bleach. Any brain that lasts longer than 30 minutes should be reported to local authorities.